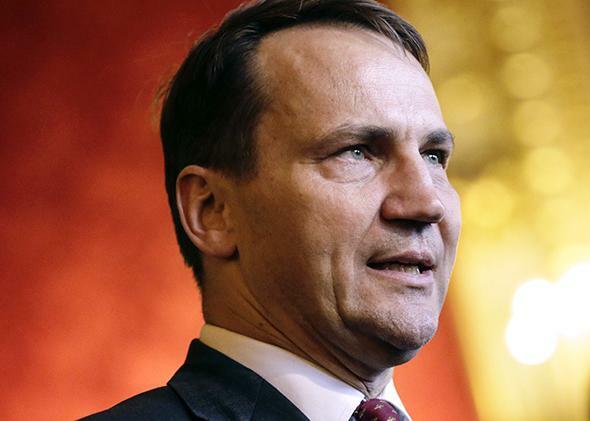 Radek Sikorski interview: The Polish foreign minister on Vladimir Putin’s recklessness in Ukraine. Polish Foreign Minister Radek Sikorski on Putin’s reckless course. Polish Foreign Minister Radoslaw Sikorski speaks in Paris on March 5, 2014. I think President Putin wants to prevent Ukraine from becoming a successful European/EU-associated country. To that end, he needs to destabilize Ukraine and to upset its electoral calendar and make it more difficult to carry out economic reforms. You worked hard to make Ukraine an EU-associated country, didn’t you? It was under the Polish presidency that the text was agreed, and we had persuaded most of the EU to say officially that the association agreement would not be the last step in our collaboration. If Ukraine had carried out the reforms, it would eventually have been able to lodge an application to the EU. Of course, Ukraine wasted a lot of time. For 20 years the country was bled by corruption, by stealing of assets, and by a populist economic policy. Twenty-five years ago, Poland and Ukraine had the same standard of living. Today we are three times richer. They also wasted the public enthusiasm after the Orange Revolution, 10 years ago. So, over time it gets harder. But I think this is the best team in Kiev we are likely to get. Prime Minister [Arseniy] Yatsenyuk is honest, competent, and knows what needs to be done. Of course they are Russians. They have equipment that only Russian armed forces possess. And we had seen the pattern in Crimea. It’s an extremely hard task to reform the country, introduce an [International Monetary Fund] adjustment program, and defend its territory at the same time. The United States is in the lead on sanctions and hopefully can tell it like it is to the Russians. And the United States is helping Ukraine, too. A $1 billion loan has just been passed in Congress. Yes, a guarantee. Which is the same thing. … And then the United States should reassure those allies in Central and Eastern Europe that have been warning about this sort of thing for years. We have an American base and a brigade in Germany, we have American bases in the U.K., in Spain, in Italy, in Turkey, but only a very small presence in Poland. Actually, Ukraine has an arms industry, which is, I think, the fourth-largest exporter in the world. The Maidan started when Yanukovych refused to sign the association agreement with the EU back in November. And then it became an anti-Yanukovych movement. … The snipers killed about 100 people while we were there, literally outside the building. Or Russia’s credibility is at stake because Russia was a signatory of the  Budapest Memorandum, and it is not the United States but Russia that broke it. But yes, if you were North Korea or Iran thinking, “Should I trust Western security guarantees if I give up my nuclear ambitions?” … That is why what President Putin is doing is so dangerous. Do you think Putin’s plan is to annex eastern Ukraine or just to destabilize it and make the government in Kiev irrelevant? People have been surprised by the passive response of the Ukrainians—the Russians walked into Crimea, and nobody lifted a finger. Russia has declared itself to be a revisionist power, unhappy and ready to break the political and legal consensus [established] after World War II and after the Cold War. That is why everybody is so concerned. The people who should be most worried by what they have heard from the Kremlin are the countries that have large concentrated Russian minorities. That is Kazakhstan, Belarus, and indeed, Latvia. But the first thing we should do is to take stock of where we are in terms of security in Europe and abandon postmodernist illusions that conflict is unthinkable. Poland’s relationship is bigger than most. We trade with Russia as much as the United States does. But our economy is smaller, so you can imagine that it is a bigger part of our economy. Seven percent of our exports go to Russia. That is why we are reluctant to impose sanctions on Russia. We would rather Russia stop doing what is giving rise to the need for sanctions. I think Russia will realize that she is far more interdependent with the rest of the world than they’ve realized so far. … Genius is knowing where to stop. Russia probably has enough resources to digest Crimea. I think all of eastern and southern Ukraine might give them indigestion.